The location of Georgia is shown in red on this simple outline map. The State of Georgia is bounded by North Carolina on the north, by Florida on the south, and by Alabama on the west. It is bounded by South Carolina on the northeast, by the Atlantic Ocean on the southeast, and by Tennessee on the northwest. Georgia is the 21st largest state in the United States, covering a land area of 57,906 square miles (149,977 square kilometers). This Georgia map site features road maps, topographical maps, and relief maps of Georgia. The detailed, scrollable road map displays Georgia counties, cities, and towns as well as Interstate, U.S., and Georgia state highways. The pannable, scalable Georgia street map can be zoomed in to show local streets and detailed imagery. to view a scalable Georgia road map. The detailed Georgia map and the regional Georgia map display cities, roads, rivers, and lakes as well as terrain features. The detailed map shows only the State of Georgia, while the regional map shows Georgia and the surrounding region. Georgia's capital city is Atlanta. Other major cities on the Georgia map include Columbus, and Macon as well as Savannah, where Georgia's first settlement was founded. There are 159 counties in Georgia; about half of the state's residents live in the Atlanta metro area counties. In 2005, the population of Georgia was estimated at 9,132,553, which is about 156.7 people per square mile. In 2010, Georgia's population rose to 9,687,653 people. The state's primary Interstate Highways include I-16, I-20, I-75, I-85, and I-95. Georgia was named for George II, who was king of England when the Georgia colony was founded. A hilly Piedmont region runs through the center of Georgia, gradually rising to the Blue Ridge Mountains in the north and leveling off to a broad coastal plain in the south and east. The Savannah, Ogeechee, and Altamaha Rivers flow from the state's interior toward the coast. The Confederate Memorial at Stone Mountain, the Little White House at Warm Springs, and Okefenokee National Wildlife Refuge attract visitors to Georgia. For Georgia travel and tourism information, visit the official Georgia tourism site and Georgia Atlas. This online Georgia reference map shows major cities, roads, railroads, and physical features in Georgia. 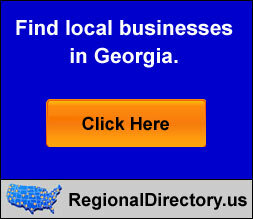 Several map publishing companies offer printed maps of Georgia. For example, Omni Resources offers several maps of Georgia that feature points of interest, airports, and parks, as well as selected local attractions and insets of major Georgia cities. Georgia-Map.org Editor, State Maps, PO Box 775, Barnegat, NJ 08005.